It's another damp and rainy day in NYC. A day to drink wine and hibernate while feasting on some good old Italian comfort food. Personally I think nothing is more comforting then a Steak Pizzaiola made with a marbly rich Ribeye steak! 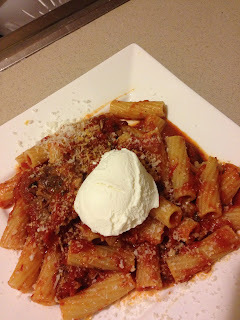 I chose to take the evil and indulgent route by serving it with some al dente rigatoni, freshly shaved pecorino with a dollop of fresh ricotta. However, you could definitely go the lighter route and serve it by itself alongside some sauteed broccoli rabe (gluten free). Have a glass of Montepulciano with it and you are good to go! Take a dutch oven, coat it with the olive oil and place it on the stove top with a medium heat under it. Add the garlic and onions, saute for one minute stirring the mixture often (be careful not to burn the onions and garlic during this process). Take the Ribeye steak, lightly sprinkle both sides of it with kosher salt then lay it in the dutch oven. Lightly brown the Ribeye on both sides. Add the canned tomato and saute stirring it often until it begins to bubble lightly. Finally, add the remaining ingredients of red wine, dried oregano, dried basil, fresh ground pepper, salt, fresh parsley, fresh basil, bay leaves and crushed red pepper flakes. Mix ingredients together well. Turn off the flame. Cover the dutch oven and place it in the oven. Bake it for 2 hours stirring it every 20 minutes or so. Remove it from the oven. Let stand for 3 minutes (I remove the bay leaves during this time). Serve. Cook the rigatoni pasta to a perfect al dente. Strain it saving some of the water. Place the empty pot back on the stove on a medium heat. Add 1/2 cup of the pasta water. 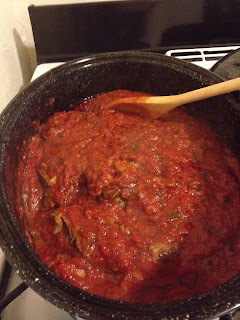 Once the pasta water is lightly bubbling transfer 2 full ladles of sauce from the Pizzaiola into the pot stirring it often. Once that begins to lightly bubble add the rigatoni and toss it around generously mixing it together (add more sauce if necessary to coat the pasta evenly). Remove from the heat immediately to avoid overcooking the pasta. Plate the rigatoni on individual plates topping each plate with some extra pieces of the ribeye steak. Add one heaping tbsp of ricotta to the top of each plate. Shave the pecorino cheese over each plate. Serve.